It’s shaping up to be a dirty year… but perhaps you hadn’t heard. Today we celebrate a special patch of soil we call Australia and I thought it fitting to point out that 2015 is the International Year of Soils – as declared by the Food and Agricultural Organisation of the United Nations. They want us to focus on the foundational importance of soil in producing sustainable food systems. “Healthy soils for a healthy life” is the motto. Dirt is the evidence of fun times on my son’s clothes when I dress him for bed. It’s the earthy womb that bears carrots and tomatoes and potatoes and beans to our table. People tell me it’s a special kind of therapy to sink your hands into it, sun-warmed and smelling sweet with decay, sifting weeds from its rich granules. Dirt is also the substance Jesus used to explain the state of the human heart in his story titled The Parable of the Sower. In Matthew 13 you will read of four different landscapes where a farmer’s seed is scattered. A path, rocky ground, amongst thorns and in good, rich soil. Jesus used parables to paint metaphorical pictures of deeper topics, and this is one of them. His words were not an observation of agricultural practices in Israel’s Galilee region – where huge crowds had gathered to hear him speak. No. His words provided an image to snag in the mind – because most of us respond better to visual stimulus. An image of our spiritual health. The seed that fell on the path describes those who hear but reject or don’t understand it. The seed that fell on rocky places describes those who receive joyfully, but their faith is shortlived. When life gets tough their faith is abandoned because their roots are not deep. The seed that fell among thorns describes those who receive but the “worries of this life and the deceitfulness of wealth choke it” (verse 22). The clamour of life takes over. And then there’s the seed that fell on good soil, a description of those who embrace a relationship with Jesus and allow his teachings to take root in the soft soil of their heart. You’ve probably identified your heart-type already. And if you’re muttering, “What a load of nonsense!” then I’d just like to say, “G’day concrete path!” It’s easy to pour concrete over your heart and treat spiritual matters with close-minded contempt. Much harder to be open and soft to the possibility of Jesus truly caring for you. The Bible makes mention of the human heart about 300 times. Heart is the word used to explain the core of our being – the seat of our emotions and desires; that spiritual thing that sets us apart from other living things. The Bible would have to be the most insightful literature on how to define and understand the human heart. Most importantly, we know that God can change our heart. I’m no green thumb but I do know something special about these flowers. Their colour is determined by the acidity of the soil. Pink is the most common hydrangea, but when the soil has a pH of around 4.5 to 5.0, you will see blooms ranging from powder to electric blue. 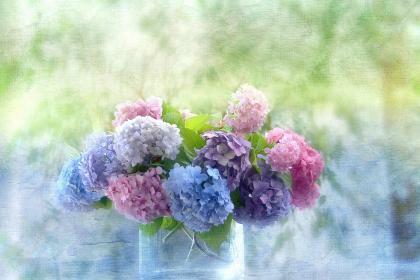 Perhaps next time you see a hydrangea you’ll be reminded to keep your heart soft to God. Because just as the hydrangea’s colour is determined by the qualities of its soil, so the culmination of one’s life is dictated by the quality of the heart. First published in The Examiner Newspaper for Keeping the Faith column on Monday January 26, 2015.